Reya is a self-taught artist living in the Netherlands. her handiwork is beautiful. her designs and minimal approach to art reminds me of nature; pure and simple. reya creates fabulous aprons, perfect to wear while making art or baking pie or shaking out the rugs. 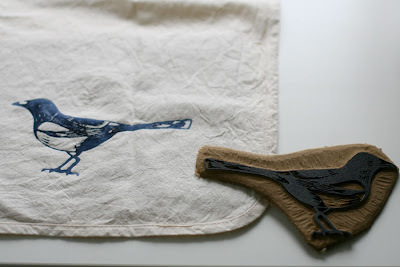 i love the magpie linocut, printed with navy blue fabric paint. this would be the kind of gift i would want to keep for myself. i know lots of ladies who would leap for such a pretty and industrious apron. whether you plan to give it to yourself or someone else, place a comment to enter to win. comments are open until saturday / april 25 / midnight / mountain time. a random winner will be announced after the weekend. be sure to visit her etsy shop & flickr to see more pretty things. oh i love this apron! the bird print is just adorable. thanks for giving us a chance to win! You always have such cute giveaways!! I cant wait to go check out her etsy shop!!! I would love to add this to my collection of aprons. Two of my favorite things combined aprons & birds. oh my that apron is lovely! i adore it's simplicity! hello! i found my way here through reya's blog and am happy for the chance at this beautiful apron. i'm a longtime fan of her work and am excited to have discovered your blog. thanks for the giveaway! I think I need this cute excuse to bake! my nickname growing up was bird since i chirped all the time. these are delightful perfect for my first home which i'm about to move into! very lovely and inspiring and what i would call zen. Beautiful! I'd be over the moon if you picked me! I love aprons so this would be a real treat! oh wow! That is beautiful! I've never had an apron before but have always wanted one. Beautiful apron! I completely love her simplistic approach. So nice! Sure hope I win! would LOVE to win - I could make my kids breakfast while wearing it and singing, "In the leafy tree tops, the birds sing good morning" - perfect. Love this apron - it looks so natural! And it comes from the Netherlands, like me. I love the simple design on this apron! I am in need of a new one. wow, this is stunning in its simplicity. i love it. wow. that is a lovely apron. I sure would ge happy to wear it. very adorable... all her stuff is great. so beautiful! I'd love a chance to win. I adore birds! I would love a chance to receive this apron! I inherited aprons from both my Grandmothers and cherish them dearly. I also wear them when cooking, baking and such. This lovely Magpie apron would make a fine addition to my collection and would be passed on to my Granddaughters. That's such a cool print. Simple and Beautiful... I love this apron! I would love that apron! It is simple and beautiful! That's so pretty and mordern looking. Please enter me. Oh that is just the most adorable apron ever! I'm crossing my fingers! Simply lovely! I always try to keep a stash of fun aprons I can rotate out since I cook professionally every day. I adore magpies—I often feel like one myself, collecting pretty and sparkly things. Thank you for the giveaway! I AM an apron 'person'! I love the simplicity of it! I will be watching with interest. good art and a good apron together? almost too good to be true. I love it! Wow, this is beautiful! (Could I bring myself to wear it when it could get dirty?) I would love to own this apron - thanks for the chance! Adorable! This apron makes me want to bake a pie. My friend loves birds and would love this apron! So cute! This would be the perfect gift for Mother's Day! Thanks for the great give-a-way! Beautifully simple apron! Love it. I love the simplicity :) I think I will go and bake something now. oh! what a wonderful treasure! so very pretty. what a nice thing to give away! This little apron looks perfect for kitchen adventures...love it! Adorable, simple and sweet. Would love a chance to win this apron. oh how lovely...count me in! I absolutely love the simplicity. I think my food would taste really good if I had this apron on while preparing. What a beautiful and simple apron! And what timing, last night I was just thinking I need an apron for when I make art. That is simply adorable. My friend Maureen's birthday was yesterday... this would be a great belated birthday gift for when she returns from her business trip. I was instantly smitten by this apron. Pick me! Pick me! This is just beautiful! I agree that it would be hard not to just keep it for myself. So simple and beautiful. Love it. I recently jumped on the apron bandwagon...I never understood aprons before I was a mom! :) Anyway, would love a cute one instead of my ratty old one from my elementary school fundraiser in 1985!!!! It's adorable! I've been looking for a cute apron for some time now. Who knew that all I'd have to do is look for one in the Netherlands?! I LOVE this apron. How beautiful and grapic. Thanks for the new source! I have been searching for an apron to wear during the children's art classes that I teach (kids sure can get things messy!). This beauty would work wonderfully. Oh Boy, if I had something this darling to wear while cooking you'd definitely find me in the kitchen. The apron is absolutely lovely. Thanks so much for bringing reya's work to my attention. This would make sure an amazing gift! Thanks for another great giveaway. That little bird is delightful - I'd love to cook, in that apron, in my kitchen with the Spring sun coming through the window. Lovely. i adore the classic simplicity of this. thanks for hosting, marta. How fun and springy! Her felted earrings are darling, too. This is perfect for my good friend. She is a wonderful cook, and her nickname is birdie! So cute! I love how understated it is, but still makes a statement. I like it! Simple. sweet. It's kind of like bringing the outside in, love the little birdy! Thanks! i really like that it is simple and functional...the frilly aprons are cute too but this is more my style. So simple and pretty - great find! You have to love aprons. I have a vintage collection and they always bring a smile to my face. They deliver a bit of festivity to even the most mundane kitchen tasks. I love simple art. This apron is lovely. Magpies are the state bird where I live! So cute! I'm totally into aprons and yet I don't even have one. This would be a great start! What a great great giveaway....really! So lovely! Thanks for sharing her with us. I love that wonderful linocut! please come live with me! thank you for hosting the giveaway. how lovely! I love that little bird. Thanks for hosting such a fun giveaway. how darling. love the simplicity of it- not too fancy to actually wear, but still so lovely. this would be the perfect addition to my ever-growing apron collection! i've never owned an apron before. i think it's time. what a pretty little apron. i love the simple design on a crisp white background. lovely! this is so cute! i love birds and aprons. yay! here's to winning and thank you for your beautiful blog. The magpie is so charming and who couldn't use an apron to wear? Great giveaway! This is so simple and beautiful...perfect late birthday present for my sister...she loves to bake! So gorgeous, I don't know that I would even be able to use it as an apron. Ach, that apron is to DIE for. I'd love to have something that cute to wear in the kitchen, now that we're getting married and I'll be able to be a REAL chef with all of our nice utensils! I am embarrassed to say that I do not actually own an apron, so this would be perfect! It is beautiful, and may encourage me to be more domesticated! How fun it would be to win that! yes yes yes! so cute - and i am trying to organize an apron swap in my family with all the ladies for christmas this year, so it would be perpfect (although I may have to keep it for myself. difficult decision). What a beautiful apron! Reya is quite talented!! I have been looking for an apron and hers are gorgeous. I would look so much more stylish bird watching as I am cooking in my kitchen! BTW, I love your blog and I check in daily! there is something about wearing an apron that makes everything seem a bit sweeter. That is one fine apron; in fact, it may be the catalyst to get me into the kitchen and cooking. Would love to have one for myself! WE are on a bird kick in the house! 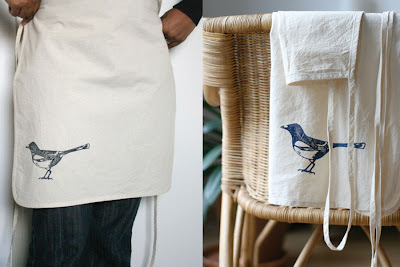 I love aprons... and bird prints! This will make me oh-so-fashionable in the kitchen, pick me! so talented and creative. love it! So beautiful! What a generous giveaway! Thanks for posting this! What a pretty apron. love to add this to my apron stash.